I am reading books to learn what “sustainability” means for communities. The book I am reading currently is called “Eco Villages: Lessons for Sustainable Community” by Karen T. Litfin. This interesting woman took a year off from teaching at the University of Washington to travel and visit 14 Eco Villages around the world. She wanted to see what they were doing that worked and what we could learn from their experiences. She found there were many differences in these Eco Villages all over the world, but there were also some common threads. The Global Ecovillage Network (GEN) was established in 1995, and lists hundreds of Eco Villages around the globe. ( http://gen.ecovillage.org/ ) GEN has published a Community Sustainability Assessment, which helps Eco Villages to gauge their sustainability. GEN’s online ecovillage design curriculum states that Ecovillages are the “seed” communities that will help spread new ideas and environmentally sound practices. People on every continent are reaching the same conclusions about our global predicament, and are coming up with ideas about how to live in harmony with nature. The web of life is sacred, and humans are a part of that web. Global environmental problems are approaching a crisis point. Positive change will come from the bottom up. Saying yes is more powerful than saying no. The key attitude of these people seemed to be “sharing.” Most of the Eco Villages shared resources such as land, food, living space, cars, tools, etc. Because of this their consumption per person was much lower than the average for their home country. The happiness of the community members seemed due to more intangible kinds of sharing – sharing knowledge and skills, joys and sorrows, births and deaths. This sharing between people living and working together seemed to be the foundation of ecological sustainability. Ecology is the study of how living organisms relate to each other and their environment. The Eco Villages all believed in the idea of harmonizing human systems with nature. Many of the Eco Villages built their homes with locally available materials such as wood, clay, sand, stone, cob, and straw bales. The Auroville Earth Institute built homes with compressed-earth bricks they made from their red soil. The Findhorn community in Scotland built some homes from used oak whiskey barrels. The author also liked the micro-huts at the Earthaven community. These were 12 by 12 foot homes with kitchen, office, living area, and a loft bedroom. These tiny homes were energy efficient with a passive solar design, solar panels, solar hot water, and a tiny wood stove. The showers and composting toilets were outside, but these people never had to pay a utility bill. The Eco Villages tried not to use fossil fuels. In Eco villages where the common buildings were close together, no cars were needed. They primarily used solar, wind, wood, and micro-hydro energy. Wind Turbines are very expensive but some of the larger communities were using them. Some European Eco Villages were using “Stirling Engines” to produce heat and electricity. These machines run on waste wood from local pulp and timber industries. Eco Villages also conserved energy by having shared laundry facilities. Most of them hung up the clothes to dry instead of using a dryer. To conserve water, many of the Eco Villages were harvesting rain water, and using natural methods to filter and treat the gray “waste water.” The Findhorn community was filtering and treating their gray water using gravity-fed holding tanks and plant roots and bacteria to clean the water. This system cleaned gray water into fresh water in just 4 days. The residents were also using about one-third of the average American daily water use. Most of the Eco Villages grew their own food for their members. Some had huge farms, and residents worked or shared in the costs of running the farm. One community had a pond stocked with fish. However, the villages did not all eat the same diet. Some communities raised animals for meat, and others were vegetarians who did not allow the slaughtering of animals. A vegetarian diet is one way to shrink a person’s ecological footprint. Many of the Eco Villages were also involved in wildlife conservation. Some communities owned forest land, and very selectively harvested timber for making furniture and building homes. The communities also planted new forests and protected them as wildlife habitats. Economy: The Eco Villages had many different approaches to money. Some Eco Villages printed their own unique money as a unit of exchange inside their community. Some communities had people who worked outside the village earning money, and people working inside the community who grew food, built homes, etc. They communally shared all the money earned so all the residents got paid the same amount. Some Eco Villages earned money by selling their homegrown and handmade items to people outside their community. Some communities generated income when visitors from the outside came to the Eco Village for educational or spiritual workshops. Some Eco Villages used no money at all. This “Gift Economy” runs on the idea of doing, giving, sharing and trading, and everyone has enough of what they need. Community: The author found that many people in the Eco Villages had left high-paying jobs on the outside, to downsize, simplify, and work in the village at something they really loved doing. These people said their greatest gain was a true sense of Community. People shared a vision, agreed on self-governance, worked together, and took part in each others’ joys and sorrows. Most of the Eco Villages functioned as a “participatory democracy.” When a decision needed to be made, they held a meeting where all the members could speak their opinions and ideas. This group process took time, but new ideas were heard, and a lively discussion and a vote followed. Many members said that compassionate, nonviolent communication was the lifeblood of community living. The communities that were doing well had achieved a balance between privacy and sharing. Each person or couple had their own private bedroom, even when kitchens and living areas were communal. Most of the Eco Villages had children who ran around safely and freely between yards that were not fenced. Many Eco Villages ran their own schools for the children who lived there. The community was involved in teaching skills to the children. The author observed that these children were used to interacting with people of all ages, and were confident, creative, and positive. The author was surprised by the amount of artistic expression she encountered on her trip. There were performances of singing and dancing, with drums and other musical instruments. Inside the communities there was lovely painting, woodworking, and sculpture. The various Eco Villages had different beliefs about God, spirit, and non-material reality. However, many communities included people of different religions and backgrounds who were able to live together in harmony. The main idea the villagers all around the world agreed on was that humans come from nature and are inseparable from nature, and the sooner we wake up to this fact the better. If we want to integrate the ecological, economic, and social dimensions of sustainability, we must allow ourselves to be transformed and integrated with Nature. Many communities practiced meditation and believed that Peace with Nature starts with Peace inside us. There was hope that we can forge a viable future by learning to abide by ecological principles and living in harmony with our natural world. One leader described this as a shift from Individualism to Universalism. Our core purpose is to harmonize our lives with our home planet. 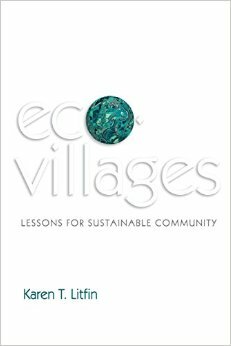 The author concludes her book by explaining how we as a society can incorporate some of the lessons from the Eco Villages. We must yoke ecology to our economies, communities, and consciousness. Cities can adopt mixed-use zoning codes that allow people to live near their workplaces. The author hopes our neighborhoods will begin to catch and store natural energy, work together to grow food in yards and parks, and begin sharing things such as potluck meals, appliances, tools, child care and cars. We need to consume less and share more, and do it closer to home. NextMy Tiny House Walls Are Getting Framed!